Meriwether Lewis spoke this sentence in 1804 as he ventured deeper into what was then unknown wilderness. It was the vast expanse that we now know as the western United States. Lewis and William Clark, along with the other Corps of Discovery expedition members, had set off from St. Louis on a journey to find a path to the Pacific Ocean, as well as to map the “untamed” wilderness and record the new flora, fauna, and animals that they encountered along the way. One can only imagine what the members of the expedition felt and witnessed during this two-year sojourn, but surely it was thrilling. The beauty of the landscapes alone — void of modern infrastructure and cities — must have truly been remarkable. As Lewis alludes to above, the visionary enchantment never seemed to end. If you’ve ever had the privilege of venturing into any wilderness area of the great American West, you too will understand his sentiment. But, if you’ve yet to witness the grandeur of the western United States for yourself, set off on your own exploration using this list of must-see places. Whether you’re an avid camper, an adventure-seeker, or just looking to take a drive through beautiful wilderness, any of these 10 places will leave you speechless. The San Juan National Forest occupies 1,878,846 acres of Colorado’s southwestern corner. A short jaunt from Durango, this national forest is an unbeatable getaway for those looking to escape the hustle and bustle of everyday life. As soon as you set foot on this land, it will be hard to think of anything other than the picture-perfect scene before you. High deserts give way to canyons that snake their way along mountain bases and valleys and crags that hide high alpine lakes and stunning meadows painted brilliantly with wildflowers. Visitors to the San Juan National Forest will not only be stunned by its scenery, but they’ll be equally shocked by the lack of visitors there. For these reasons alone, it’s an especially ideal destination. Nestled snugly on the Canadian border, Glacier National Park is home to some of the most pristine wilderness in the lower 48 states. One million acres of land make up this treat of a park, which consists of two impressive mountain ranges, 130-plus lakes, hundreds of animal species, and high alpine forests you’d have to see to believe. Take a drive over historic Going-to-the-Sun Road, or work up a sweat hiking up to the glacial-blue waters of Cracker Lake. Regardless of what you see and do within this park, you’ll leave feeling refreshed and inspired. In 1872, President Ulysses S. Grant signed a bill that would make Yellowstone National Park America’s first ever. Spanning Idaho, Wyoming, and Montana, this park encompasses 2,219,791 acres of unbelievable wildlife, waterfalls, lakes, and more. 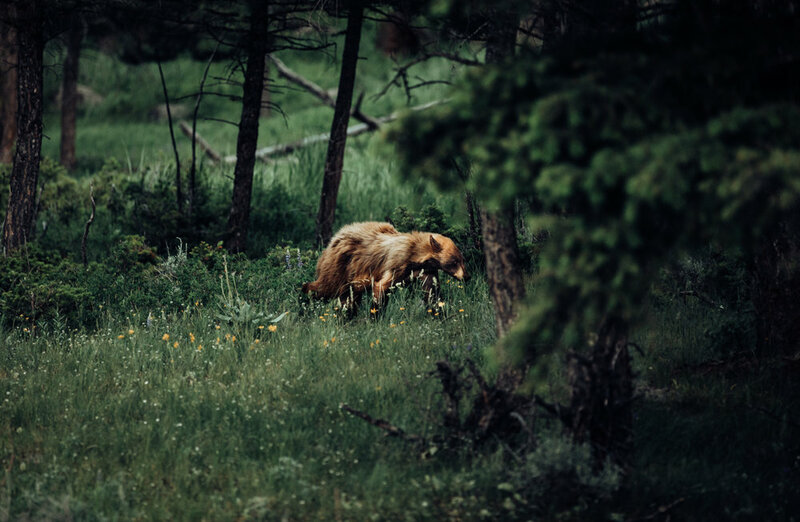 While Yellowstone’s gorgeous landscape is a huge draw, what differentiates it from most other wilderness areas on this list is its incredible wildlife. Wolves, grizzlies, and black bears make up only a fraction of the mammals here, establishing the park as an excellent wildlife-viewing destination. Who said you had to be in Africa or Asia to go on safari? The Bridger Wilderness in Wyoming has a quality that is truly indescribable. Located in the western portion of the state, this region is vast, quiet, and remote. When you pay a visit to the area, you feel as though you’ve been transported back in time — it’s as if no world outside of what lies before you exists. Over 600 miles (965 km) of hiking trails are maintained throughout Bridger, making it an exceptional region for hiking and backpacking. Ascend moderate to strenuous trails through the Wind River Range and into the nearby Popo Agie Wilderness area where alpine lakes, wildflowers, and curious animals abound. Note that camping and fishing are permitted in Bridger Wilderness, so long as you abide by dispersed camping rules and possess the necessary permits. If you’re fond of dramatic, crystalline-blue alpine lakes flanked by sharp rock faces on all sides, then a trip to North Cascades National Park is a must. The park is home to 312 glaciers — more than any other park in the continental United States. Each of these glaciers has played a vital role in creating the visually stunning landscape that the park is known for. They have carved out beautiful, hidden valleys and lakes peak after peak across the Cascade Range. Take off on a day-long trek through Maple Pass Loop or, for the seasoned backpacker, consider taking on the strenuous Devils Dome Loop — 43 miles of pristine, seemingly untouched wilderness. Just don’t forget to grab a permit, and leave no trace along the way. Whether you’ve been to Grand Teton National Park or not, you’ve likely seen photos of the serrated peaks that comprise the Teton mountains and loom precariously above the valley floor. Between those daunting summits and the outstanding wildlife, this park rivals nearby Yellowstone — which is not an easy feat to accomplish! A plethora of animals can be seen roaming the park, so whether you’re driving along Teton Park Road or floating lazily down the Snake River on a boat tour, be sure to keep an eye out! You could even join one of the park’s ranger-led programs, which teach visitors about the natural and cultural history of the region. This park may be more of an off-the-beaten-path destination than others on this list, but that’s what makes it especially sweet. I assure you, there are no potatoes in sight here. Situated in south-central Idaho, Sawtooth National Forest spans an incredible 2,110,408 acres, with 4 percent of that extending eastward into the neighboring state of Utah. Home to over 1,100 lakes; hundreds of miles of trails for hiking, biking, and trail-running; and 81 campgrounds, this national forest is a haven for any who enjoy the great outdoors. Wide-open spaces and plenty of stunning vistas make this national forest one of America’s best. Combine the attractiveness of the region with its remoteness and absence of visitors, and you’ve got one spectacular place to explore. John Muir eloquently said, “It is easier to feel than to realize, or in any way explain, Yosemite grandeur.” And he was right. The first descent you make into Yosemite Valleywill surely take your breath away. With one panoramic sweep, you’ll witness the majesty of Yosemite Falls, the sheer verticality of El Capitan’s face, and the towering visage of Half Dome peeking out beyond the valley ridge. Though its valley is crowded and its trails frequently packed, no trip to the western United States is complete until you’ve driven, hiked, and ventured through this immaculate wilderness. After all, it is one of America’s most revered national parks for a reason. Though crowded, this wilderness area is not to be missed. Covering 281,190 acres, the Three Sisters Wilderness is nestled comfortably between Bend and Eugene, Oregon, and can be entered from either city. Rife with wildlife and speckled with glaciers and wildflowers, this wilderness area is an attractive destination both for its beauty and its proximity to nearby Bend and Eugene, making it ideal for day-trips from either city. To avoid the crowds (this is true of most wilderness areas), consider visiting during the shoulder season or in the middle of the week. Upon visiting, you’ll have the opportunity to traverse parts of the Pacific Crest Trail, camp, fish, and engage in a slew of other activities. If you find yourself in Oregon, it’s more than worth the trip. The Frank Church River of No Return Wilderness in Idaho is the second-largest wilderness area in the continental United States. Renowned for its powerful rivers and white-water rafting, this region draws in adrenaline junkies and water-sport enthusiasts from all over the world. But, as one would imagine with a wilderness area so large, rafting isn’t the only past-time. An impressive list of animals and world-class fishing opportunities bring in wildlife fanatics, biologists, and anglers from all over the world. Whether you’re here to spot the rare wolverine, take on the Salmon River’s class-five rapids, or simply pull up a chair on the river’s banks to relax, this wilderness area has plenty to offer. One of the most intriguing aspects of visiting wilderness areas in the west is that, even when they’re busy, walking along a trail or setting up camp can feel as though you’re the first to be there — like you’re discovering something special for the very first time. You could almost swear that no one else has smelled the crispness of the fresh mountain air or seen the rocky peaks in front of you painted gold, purple, and red with the setting sun, that no one has seen it like you have. To witness this incredible natural world so far removed from the polluted, loud, and densely populated towns and cities which make up so much of our world is a gift not everyone has. If it is possible for you to do so, take advantage of it. Visit these pristine, untrammeled lands. Experience the beauty and the solitude and the quiet they have to offer. But always remember to leave them as you found them — wild.